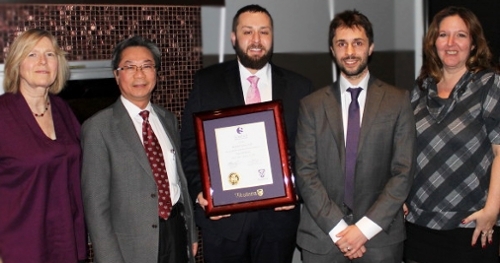 Dr. Michael Pariser and Dr. Amjad Bader are the first residents in Canada to complete a residency in Pain Medicine. We said farewell to Dr. Michael Pariser on January 4th 2016 and wished him the very best in his new endavours. It was a celebration like none before. Dr. Michael Pariser along with Dr. Amjad Bader are the inaugural residents to complete a residency in Pain Medicine in Canada. “You are the icebreakers” said Dr. Geoff Bellingham, Program Director for Pain Medicine at Western University as there was no precedence set anywhere in Canada for these two residents. In July of 2014 they started the journey of completing their PGY6 and PGY7 in Pain Medicine and along with the Pain Medicine Residency Program Committee, they blazed the trail for many future Pain Medicine residents. This milestone for the Schulich School of Medicine & Dentistry was recognized by Dr. Davy Cheng, Chair-Chief, Anesthesia & Perioperative Medicine who congratulated Dr. Pariser on this significant occasion. He reminded Dr. Pariser that he is an ambassador for Western’s Pain Medicine Program wherever he goes and that he will always be seen as a pioneer who led the way. Dr. Pariser has accepted a position in Nanaimo, British Columbia and he is traveling there with his family to join a practice that was looking for his specific competencies. Saying our farewells we were reminded that every ending has a new beginning. It was clear that Dr. Pariser was very happy and that he was really excited for his future. It will be very rewarding to see how his future evolves as time unwinds. We wish him all the best.